For the first time in at least a decade, the Faculty of the Humanities and Social Sciences will include post-doctoral fellows for the coming academic year. 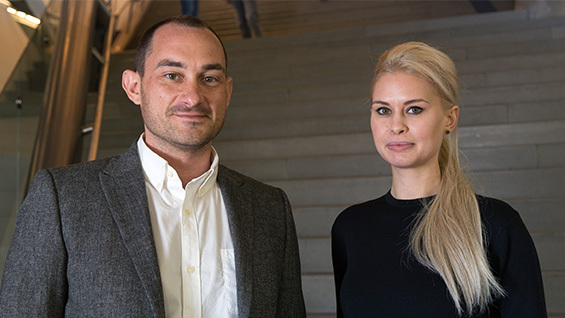 Dr. Allison Leigh, an art historian, and Dr. Nicholas D'Avella, an anthropologist, will teach courses while they each work on a book related to their doctoral work. "I'm thrilled," William Germano, dean of the faculty, says. "It's really important we expand the group of on-site faculty. They are both eager and smart and have lots of teaching experience. So I am really happy." Post-doctoral fellows differ from adjunct faculty in that they must have already been awarded their Ph.D. and are required to teach and be present exclusively at the institution where they are fellows. As is typical for such fellowships, Drs. Leigh and D’Avella will teach a more limited load of three courses each over the academic year, while also working on a book based on their doctoral work. "A post-doc is focused on this institution and these students," Dean Germano says. "They will have office hours on a regular basis. They will be here three days a week. Students can come see them. The post-docs will also each do public presentations. So there will be opportunities for other faculty to engage with them. So the benefits are to the students but also the faculty and to Cooper as a community." Dr. Leigh, who received her Ph.D. in art history from Rutgers University in May, describes her appointment as a "dream scenario." "I started grad school because I wanted to be a professor," she says. "I love doing my research too, because to do this you really have to, and I did a fair amount of curating exhibitions, but I was always waiting to teach. So I think Cooper is a really good fit for me because everybody says it's all about the students here." Her dissertation focuses on comparing the themes of male malaise in 19th-century Russian art and literature with what she sees as a similar phenomenon in French artistic practice at the same time. "I tried to think about how we can understand what we define as modernism or modernity from an emotional standpoint. But not so much from the gender studies aspect of what were women's experiences -- how were things changing as a result of women entering public roles -- but how can we think about the flip side of that. What happened to men as all of that was occurring?" "I like puzzles," Dr. Leigh says. "I think of history as a machine that I am trying to make work by taking pieces out and putting them in different places. I would never say I have an engineer's brain, but I like Cooper's idea of art, architecture and engineering: that all of those minds somehow are doing something similar. My brand of history does that. Definitely." Dr. D’Avella received his Ph.D. from the University of California, Davis in 2012. This is his second post-doctoral fellowship; he spent two years as a fellow at the University of California, Berkeley. He last lived in New York City from 2001 to 2004 when he worked at Streetwork Project, a homeless youth shelter. This urban experience mixed with a growing interest in Latin America and eventually led to Dr. D’Avella’s anthropological work centering on a construction boom in Buenos Aires, Argentina that began in the aftermath of a political and economic collapse in 2001. “I followed the lives of buildings in several different, overlapping communities of practice,” Dr. D’Avella says. “I worked with real estate investors and real estate market analysts and how they understand the place of real estate as an investment. I worked with architects both at the University at Buenos Aires and in private practice to understand how changes in the real estate market were changing the work they do and the way they think about buildings. And I worked with neighborhood residents who were working to change the urban planning code in order to stop high density construction in their neighborhoods. So the work is to look at how the tensions around these different ideas and values and buildings come together. “One of the exciting things for me about being at The Cooper Union is the chance to be around people thinking through some questions close to my own,” Dr. D’Avella says. “I look forward to the chance to spend some time in the School of Architecture, to learn how architectural education here at Cooper or in the U.S. lines up with my experience in Buenos Aires, which was an enormous institution with a unique and very present political history."